Com. Prakash Karat, Member of the Polit Bureau of the CPI(M) in his speech at the valedictory session of the International Congress of Kerala Studies said that the alternative proposal for the future development of Kerala should be drafted by considering the global and national scenario and the limitations, the neo-liberal policies had imposed on us. The Global financial system has not yet completely recovered from the 2007-08 recession. The negative effects of the recession are still lingering in the developed and developing nations. The prices of oil and oil products have fallen by 70%. In the national scenario the government led by Modi is more severely implementing the neo-liberal policies. The crisis in the agricultural sector is alarming. The industrial sector is also in peril. The government is privatizing even the basic service sectors. The Modi government is implementing these neo-liberal policies with the support and protection of the majority communalism. Inequality is increasing. The central government has disbanded the Planning Commission itself and cut down the state’s share in plan allocation which will simultaneously pressurize the state governments. We must consider these entire factors while we are discussing and drafting a development approach for the future of Kerala. The state governments have to compete against one another for capital funds for their developmental purposes. The Left in the states like Kerala cannot yield before the corporate for investments. For the state of Kerala a people oriented development path is most suitable. The existing achievements should be updated and new horizons should be sought by utmost concentration of finance, natural recourses and human recourses made available for the state. The achievements in the social service sector should also be improved taken forward. The evaluation by the 1st ICKS that ‘only through escalating the production of commodities can make Kerala surge ahead’ is still relevant. There is no scope for huge industries in Kerala as if in some other states. IT and Bio-technology industries should be promoted. The small and traditional industries should be upgraded and promoted in such a way to protect the interest of the workers and promoters belonging to that sector. Public sector should be upgraded and protected. The quality of education especially of the professional education should be improved. There should a suitable program to resolve the crisis of fall in the prices of agricultural products. Gender equality must also be assured while considering the developmental agenda. A sustainable development by protecting the environment is the need of the hour. Com. Karat also said that the five year ruling of the Congress led UDF government had destroyed the development achieved by the state in deferent sectors including the industrial sector. Previous LDF Government had initiated various developmental activities and brought many reforms throughout the state. The achievements made by the previous LDF government are projected by the UDF government as its new achievements. The developmental initiatives taken by the previous LDF government could have been completed at least two years back, if there was a continuation of LDF lead government. Com: Karat pointed out the need of a government which could protect the people from the anti people and neo-liberal policies of the central government and at the same time to strengthen the secular and democratic fabric of the state and simultaneously implementing development initiatives. The valedictory session was presided over by Com. 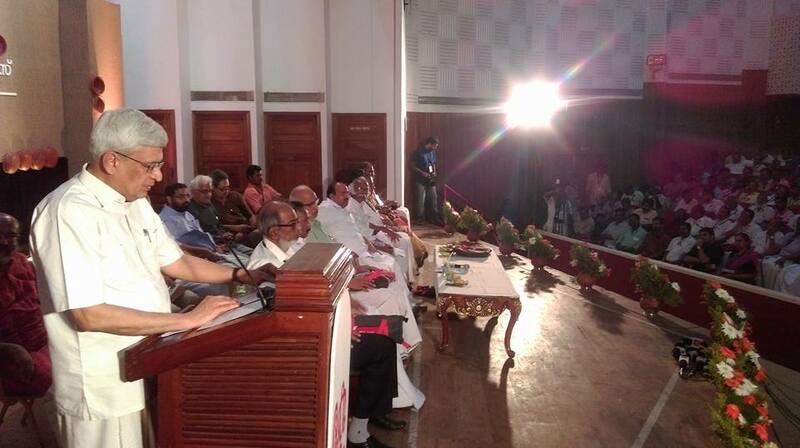 Kodiyeri Balakrishnan, Secretary Kerala State Committee, while Dr. Thomas Issac welcomed the audience.